Description: Located in Byron Bay on the far North Coast of NSW just minutes from the town centre and Byron's renowned surfing beaches, is this sprawling and private Estate on three easy care acres. The main 5 bedroom 5 bathroom master built residence, features open plan living, entertainers kitchen, high ceilings, polished timber flooring, air-conditioning and extensive covered verandahs perfect for relaxing and al fresco entertaining. The second private 3 bedroom, 3 bathroom residence, complete with decks, courtyard and separate entrance is ideal for the extended family. In addition there is a separate studio games room opening out to the large deck which overlooks the magnificent and ever changing dramatic hinterland. A sparkling in-ground salt water pool, gazebo and BBQ area make for the perfect setting to live the great Australian dream. The backyard shed has long been a part of Australian culture and an additional bonus to this fabulous property is the huge "man" shed. A great space for both men and women alike to work on meaningful and not so meaningful projects at one's own pace in one's own time. Also provides plenty of storage area for that motor-home, boat or caravan. 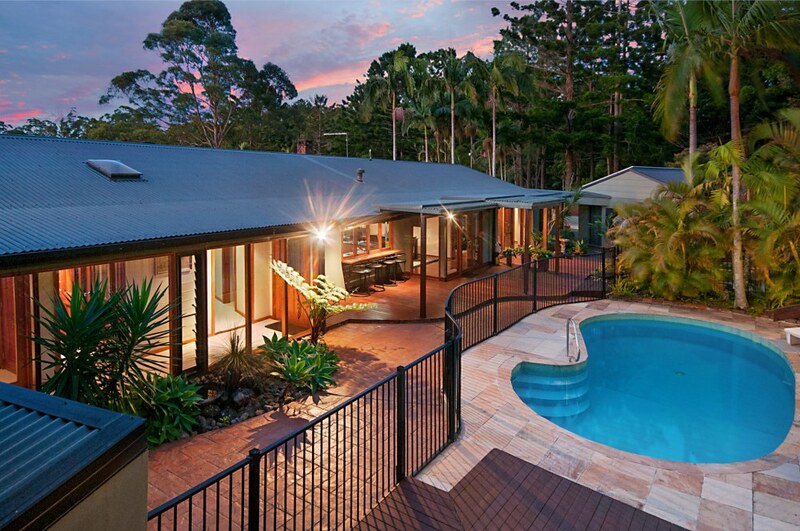 Landscaped gardens and fruit trees and fully fenced paddock complete the picture. Byron Bay, voted one of the world's best destinations, is famous for its unique ambience, boutique shops, cafes, restaurants, eclectic spirit, relaxed beach culture and independent way of life captivating people for years from all over the world. This fabulous property is perfectly located just minutes from the CBD of Byron Bay with its turquoise blue waters and white sandy beaches making it the ultimate location for those seeking the perfect lifestyle. To arrange an inspection of this special property, with so much to offer, please contact Janis Perkins on 0438 841 122. Contact Real Estate Of Distinction Today!!! Email Real Estate Of Distinction Now!